Transhuman or trans-human is a term that has been defined and redefined many times in history. In its contemporary usage, “Transhuman” refers to an intermediary form between the human and the hypothetical Posthuman. Transhumanism, abbreviated as H+ or h+, is an international intellectual and cultural movement that affirms the possibility and desirability of fundamentally transforming the human condition by developing and making widely available technologies to eliminate aging and to greatly enhance human intellectual, physical, and psychological capacities. Transhumanist thinkers study the potential benefits and dangers of emerging technologies that could overcome fundamental human limitations, as well as study the ethical matters involved in developing and using such technologies. They predict that human beings may eventually be able to transform themselves into beings with such greatly expanded abilities as to merit the label “Posthuman“. The contemporary meaning of the term Transhumanism was foreshadowed by one of the first professors of futurology, FM-2030, who taught “new concepts of the Human” at The New School in New York City in the 1960s, when he began to identify people who adopt the technologies, lifestyles and world views transitional to “posthumanity” as “Transhuman“. It is a matter of debate whether Transhumanism is a branch of “posthumanism” and how posthumanism should be conceptualized with regard to Transhumanism. The latter is often referred to as a variant or an activist form of posthumanism by its conservative, Christian and progressive critics. A common feature of Transhumanism and philosophical posthumanism is the future vision of a new intelligent species, into which humanity will evolve, which will supplement humanity or supersede it. Transhumanism stresses the evolutionary perspective, including sometimes the creation of a highly intelligent animal species by way of cognitive enhancement (i.e. biological uplift), but clings to a “Posthuman future” as the final goal of participant evolution. Some secular humanists conceive Transhumanism as an offspring of the humanist Freethought movement and argue that transhumanists differ from the human mainstream by having a specific focus on technological approaches to resolving human concerns (i.e. technocentrism) and on the issue of mortality. However, other progressives have argued that posthumanism, whether it be its philosophical or activist forms, amount to a shift away from concerns about social justice, from the reform of human institutions and from other Enlightenment preoccupations, toward narcissistic longings for a transcendence of the human body in quest of more exquisite ways of being. In this view, Transhumanism is abandoning the goals of humanism, the Enlightenment, and progressive politics. While many transhumanist theorists and advocates seek to apply reason, science and technology for the purposes of reducing poverty, disease, disability, and malnutrition around the globe, Transhumanism is distinctive in its particular focus on the applications of technologies to the improvement of human bodies at the individual level. Transhumanist philosophers argue that there not only exists a perfectionist ethical imperative for humans to strive for progress and improvement of the human condition but that it is possible and desirable for humanity to enter a Transhuman phase of existence, in which humans are in control of their own evolution. In such a phase, natural evolution would be replaced with deliberate change. Although some transhumanists report having religious or spiritual views, they are for the most part atheists, agnostics or secular humanists. Many transhumanists believe in the compatibility of human minds with computer hardware, with the theoretical implication that human consciousness may someday be transferred to alternative media, a speculative technique commonly known as “mind uploading“. 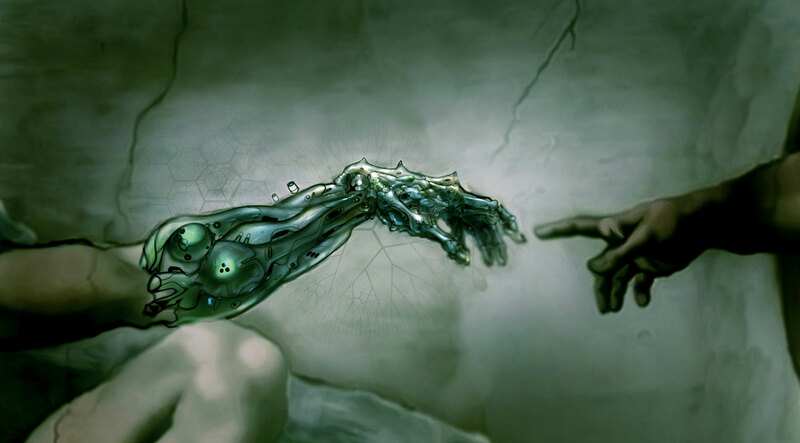 Transhumanists support the emergence and convergence of technologies such as nanotechnology, biotechnology, information technology and cognitive science (NBIC), and hypothetical future technologies such as simulated reality, artificial intelligence, superintelligence, mind uploading, chemical brain preservation, and cryonics. They believe that humans can and should use these technologies to become more than human. They therefore support the recognition and/or protection of cognitive liberty, morphological freedom, and procreative liberty as civil liberties, so as to guarantee individuals the choice of using human enhancement technologies on themselves and their children. Some speculate that human enhancement techniques and other emerging technologies may facilitate more radical human enhancement no later than the midpoint of the 21st century.